Ra’s Al Ghul is back! Well, he isn’t, but he is… sort of. 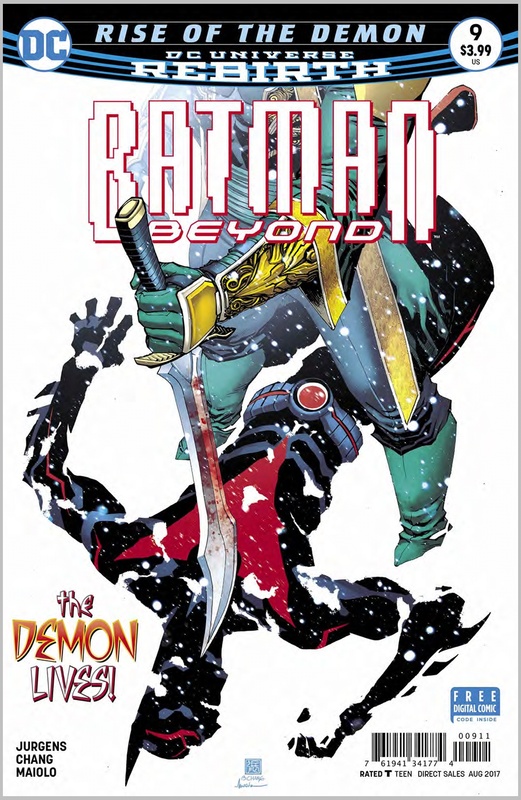 In “Rise Of The Demon,” Part Four The heir of Ra’s has taken his place as the leader of the League Of Assassins, Damian Wayne – Son Of Batman – is the new Demon’s Head. 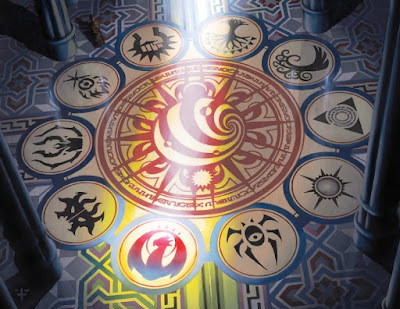 In the last issue, we saw Terry lured to the villain’s lair. The returned Al Ghul seemed very impatient to meet to the new Batman, and now we all know why. 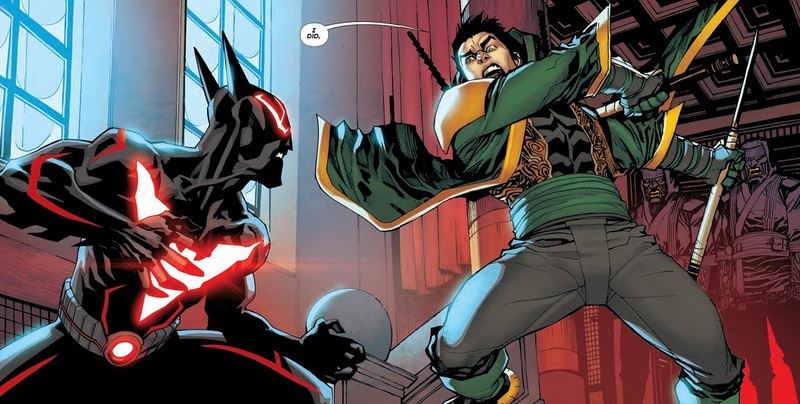 Damian, former Robin and owner of Terry’s new armor, is most displeased with his successor. Dan Jurgens writes Damian very close to the character’s original premise, as created by legendary bat-scribe Grant Morrison. Cocky, arrogant, angry and self entitled. Wayne Jr.’s attack on Terry is full-on, ruthless and utterly vicious. The whole time I was reading I was shocked. “Damian, NO… he’s your brother!” Don’t you just hate it when characters in comics and on TV can’t hear you? 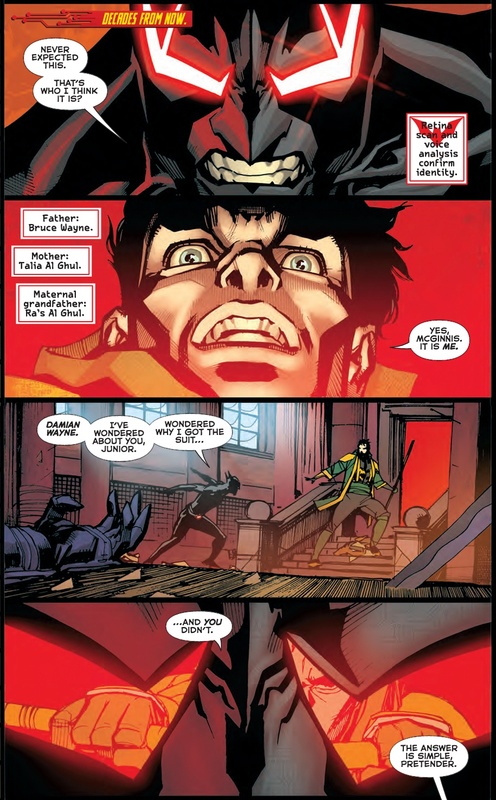 The main problem is that all Damian sees is a man who stole his legacy and, possibly, his father’s affections. 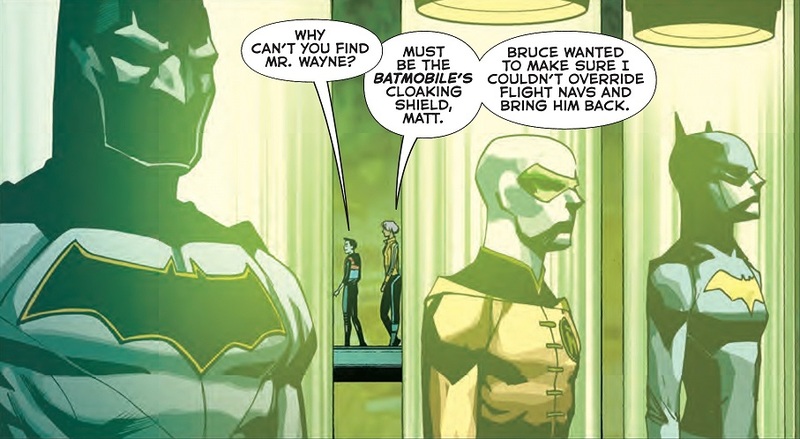 I don’t know if he is aware that Terry, like Damian himself, is Bruce Wayne’s son. 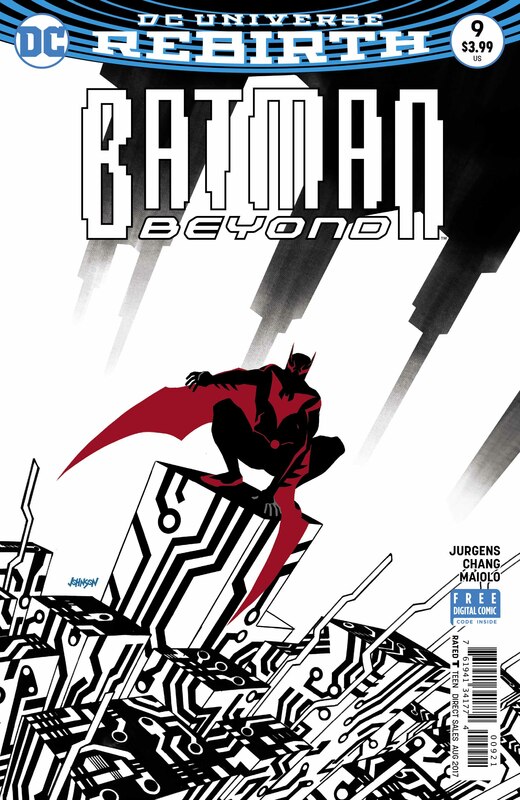 I’m loving the whole possible future that Dan Jurgens is creating every month in Batman Beyond. The potential for stories is huge and, while these stories are not definitely what’s going to happen to these characters, Jurgens’s knowledge and understanding of them makes these fates all the more credible. 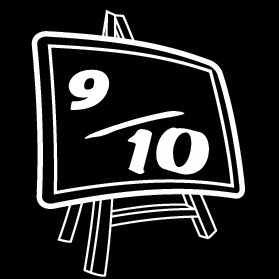 Of all the titles I review, this is the only one that comes out just once per month. This means that, creatively, this book is the most consistent. Many of DC’s Rebirth titles release a new issue every two weeks, meaning that twice as much writing and art is required. These books have rotating art teams that, no matter how talented they are, cannot make every issue the same. I’m fortunate that those books have great teams behind them and look fantastic, even if they’re not uniform. 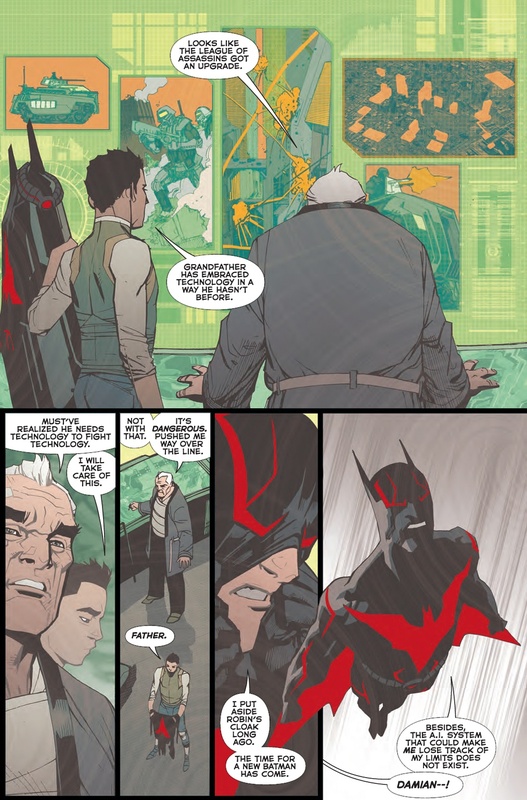 Batman Beyond has the amazing Bernard Chang on art duty, I rave about his work continuously. Almost a year into the new run of this title and Mr. Chang has drawn every issue but one! I find that pretty darned impressive. His style is very easy on the eyes and the perfect combination of comic-book and animation style Batman. A worthy mention must also be made to comics’ unsung heroes Marcelo Maiolo and Travis Lanham; the color artist and letterer. Mr. Maiolo’s touches help complete the book and help give it its consistent feel. His weather effects, his flashbacks, the neon glow of Terry’s armor and the glint of light off swords and weaponry is simply terrific. 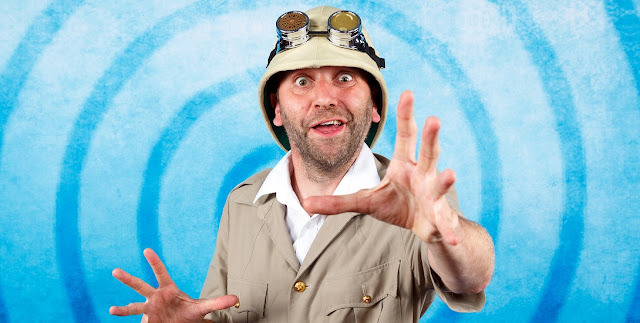 Mr. Lanham’s style is consistent, legible, and his vibrant onomatopoeic sound effects finish the book, without detracting from the art, like the sprinkles on ice-cream. This is a team that works brilliantly together. 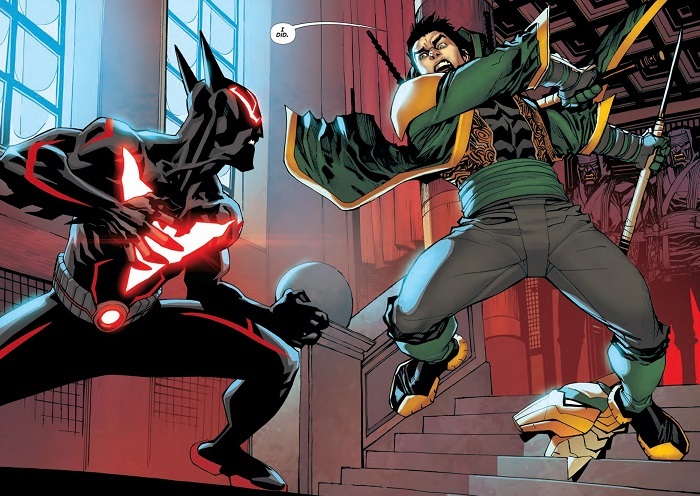 With Bruce arriving on the scene to witness his sons attempting to kill each other as the climax to the issue, the desire to keep reading is intense. 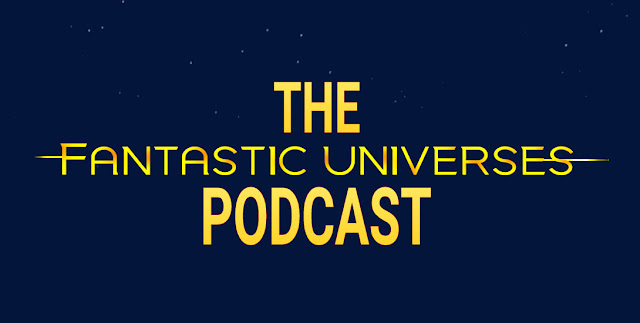 This book is all action, but without sacrificing the important character beats. Dan Jurgens’ slow reveals of the new history between today’s Batman and the Batman of the future, married to the superb visuals of Bernard Chang and Marcelo Maiolo make every issue a very satisfying read. “Rise Of The Demon,” Part Four is no exception.